Summary and Definition: The 1904 Northern Securities case was a federal prosecution in which President Roosevelt ordered the Department of Justice to take the Northern Securities Company to court for violating the Sherman Antitrust Act in his “trust-busting” efforts to break up Big business monopolies. The Northern Securities Company was a Trust set up by banker J.P. Morgan and railroad magnate James J. Hill. Northern Securities case was a great victory for President Roosevelt when the Supreme Court ordered the Northern Securities company to be dissolved. 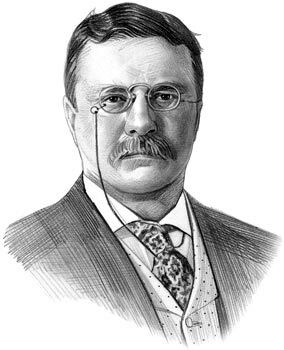 Theodore Roosevelt was the 26th American President who served in office from September 14, 1901 to March 4, 1909. One of the important events during his presidency was the Northern Securities case. The Progressive Era saw the introduction of a vast range of Federal Reforms in relation to Conservation, health and safety measures, consumer protection and economic regulations. Theodore Roosevelt was the most influential of all the leaders of the progressive movement and whilst his presidency focused on efficiency and fairness he wanted to reduce the power held by Big Business and Corporations who had set up new businesses called Trusts. Big Businesses and corporations formed 'Trusts' which enabled them to merge businesses without violating the laws against owning other companies. The establishment of the Trusts was a way to monopolize an industry and continue the practice of regulating the supply and price of commodities. New laws were passed in response to public demand that the monopolies should be be regulated. The 1890 Sherman Antitrust Act was passed by Congress to protect commerce and trade from unfair business practices that controlled prices or limited competition. A new law was passed allowing companies to create a new organization called 'Holding Companies'. A Holding Company owned the stock of companies but did not produce anything themselves, this allowed for all of its small companies to be merged into one massive organization. The ruthless Robber Barons of American industries fought to increase their empires, profits and power. A serious fight between some of the Robber Barons erupted on the Stock Exchange over who would gain control over the Burlington Railroad. The railroad magnate E.H. Harriman who owned the Union Pacific Railroad wanted the Burlington Railroad. But James J. Hill, the owner of the Northern Pacific Railroads, joined forces with banker J.P. Morgan who together, also wanted to buy the railroad. The stock battle nearly triggered a financial panic. Eventually the three men joined together, bought the Burlington Railroad and created a massive new holding company called Northern Securities. The formation of the Northern Securities Holding Company resulted in an outcry by the American Public. These enormously wealthy magnates appeared to do whatever they wanted - finding loopholes such as the formation of Holding Companies. The were so powerful they believed they were untouchable. President Roosevelt made the decision to take them to task. He and his advisors believed that the Northern Securities Holding Company had formed a monopoly and was in violation of the 1890 Sherman Antitrust Act. "If we have done anything wrong send your man to my man and they can fix it up." or could be induced to come to an agreement to ruin none." In 1904 in the Northern Securities vs US legal case, the Supreme Court ruled, four to five, that Northern Securities had indeed violated the Sherman Antitrust Law. After the federal prosecution, the Northern Securities company was dissolved. What were the Effects of the Northern Securities Case? ● Newspapers hailed President Roosevelt as a "trustbuster"
Why was the Northern Securities Case Significant? The article on the Northern Securities provides detailed facts and a summary of one of the important events during his presidential term in office. The following video will give you additional important facts and dates about the political events experienced by the 26th American President whose presidency spanned from September 14, 1901 to March 4, 1909.